TimeForge is a complete labor management tool, and one of the most useful features of TimeForge is the ability to quickly and easily create employee schedules. Once your employees and positions are configured in the software, creating an employee schedule is easy! In just a few clicks, a complete employee work schedule can be assembled and posted for all staff members to view. TimeForge allows you to build a labor schedule in different ways – depending on your exact scheduling needs. You could even choose to use the AutoScheduler and have accurate employee schedules created automatically for you. TimeForge includes a Daily View, which includes a bar/gantt chart to easily determine staffing levels, as well as a Weekly View, which resembles Microsoft Excel and allows you to work on an entire week at a time. To delete a schedule, click the red “Delete” link for that schedule. 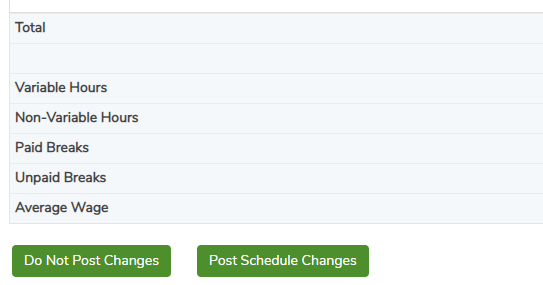 To post a schedule, click the green “Post” button for that schedule. To edit an unpublished schedule, click the “Edit” link next to an existing unpublished schedule. To create a template out of an existing schedule, click the “Make Template” link. You cannot delete a posted schedule if it is in the past. If your account is configured with Sales Forecasting, you may also have the option to choose an appropriate Sales Category. Click Add This Schedule when finished. Next, you’ll want to assign employees to your schedule, with or without a template. You can select a template for each specific department. You can choose to upload a schedule you already have as an Excel spreadsheet or CSV. To build staff member schedules without a template, click this option and ignore the option to select a template for each day. You can select which days you want a template to be applied to. 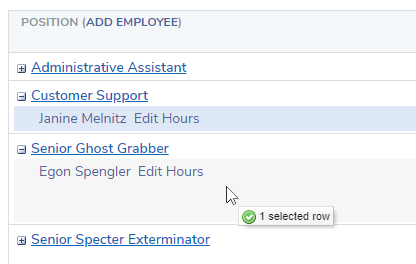 Click Assign Employees when you are finished. 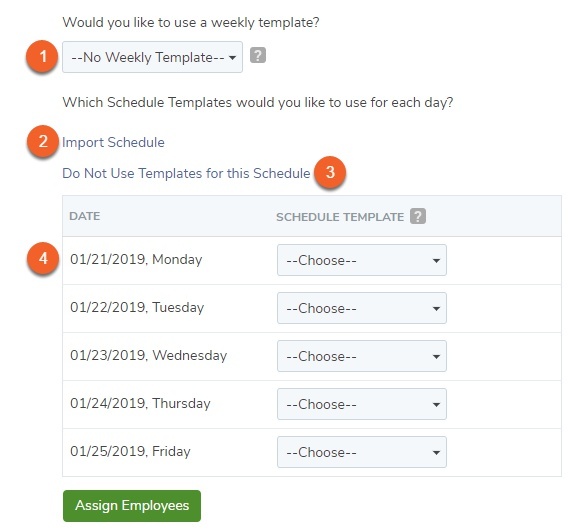 TimeForge allows you to build an employee schedule in different ways – depending on your needs. TimeForge includes a Daily View, which includes a bar chart to easily determine staffing levels, as well as a Weekly View, which resembles Microsoft Excel, and allows you to work on an entire week at a time. Pictured below is the Daily View. Make a schedule template from the shifts you have created, or use a previously created schedule template to make a schedule fast! If you have at least one schedule template, you can choose to use the TimeForge ShiftBuilder to help automatically build a schedule for you. Choose Daily Labor Costs to review a graph of labor costs by position. The work schedule can be built by employee (Schedule By Employee), or by position (Schedule By Position). Switch back and forth with a single click. 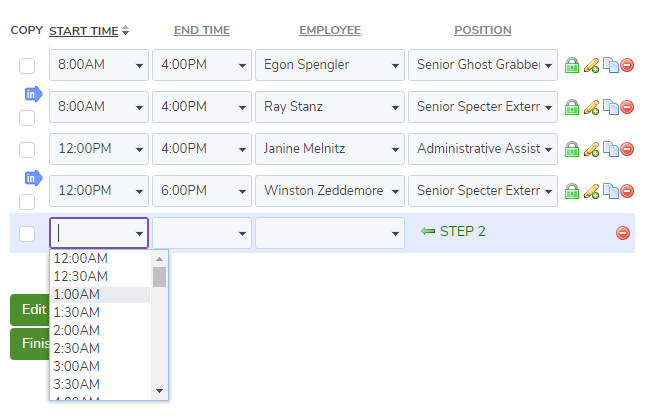 Adding a shift is easy – just pick the start and end times, then choose the employee or position from the drop-down. That’s it! A graphical chart is shown next to each shift to allow you to easily staff your business. If you have breaks enabled and break rules created, you can choose to edit the daily breaks that are created from your employee break rules. Choose the job code for this shift from the Position drop-down box. Positions that do not have employees assigned will not be shown in the “position” drop-down. After choosing the start and end times on the Daily View, and a position for the shift, click on the Employee drop-down. TimeForge will display a listing of all possible employees that are available to fill this shift. Information about each employee will be shown, including their name, skill level for this position, an approximate cost to have the employee work this shift, and any notes about employee availability or requests. Additionally — the “AutoSchedule” option is available. 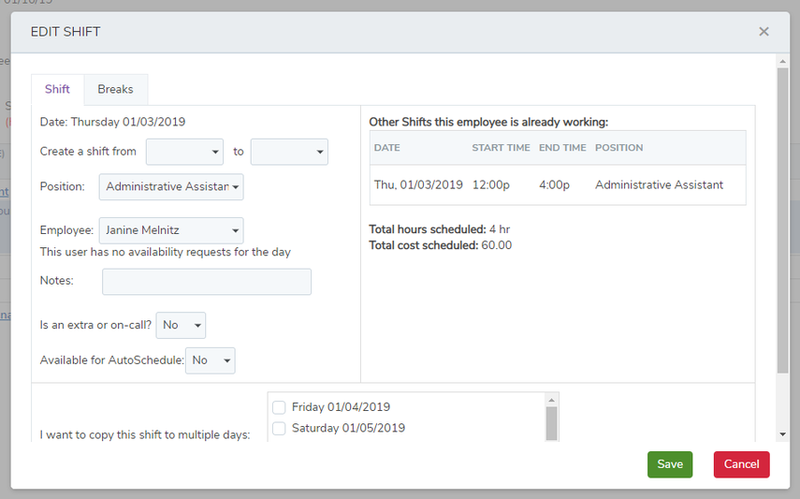 When you choose the “AutoSchedule” option, TimeForge will automatically look for the employee that is a “best fit” for the schedule, based on available hours, employee constraints (such as their availability), cost of labor, and a number of scheduling best practices. The schedule can be built by employee (Schedule By Employee), or by position (Schedule By Position) or by Time. Switch back and forth with a single click. Group summaries (such as the total hours, number of shifts, and labor costs) can be switched on and off by clicking on Group Summaries. Click on Times, Hours, or Costs to quickly display each shift’s start and end times, hours of duration, or the cost of the shift. No more sorting through Excel for this data! Important messages about the schedule, including broken scheduling rules and best practices are displayed at the top of the Weekly View. Click on the date header (such as Sat 08/08 or Sun 08/09) to view a pop-up window of additional actions, such as switching to the “Daily View,” creating a template, copying shifts from one day to another day, and much more! Click “Add Shift” or the start and end time of the shift to add or edit a new shift for the employee. In the Weekly View, clicking Add Shift will show the window below. This window allows you to quickly add a shift to an employee / position combination, shows any other shifts that the employee is already scheduled for, and displays any requested time off. 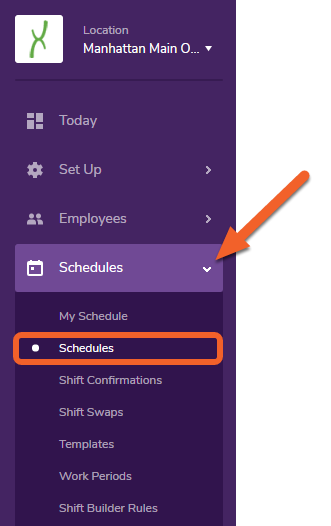 Shifts can also be copied to other days of the schedule with a single click! You can choose to copy (duplicate) or move the shifts from one employee to another. Copy the shifts to copy any upcoming shifts, leaving the original shifts intact. Move the shifts to transfer shifts from one staff member to another. When the schedule is complete, it should be Posted. Posted schedules can be seen by all staff members that have access to TimeForge. Schedules that are not yet posted cannot be viewed by employees. To post, simply click Post Schedule Changes. Your schedule will now be viewable by your employees that log in to TimeForge. Otherwise, you can click Do Not Post Changes to save your schedule without posting it. The schedule can only be posted from the Weekly View, giving you one last chance to see the entire schedule before giving it to your employees. 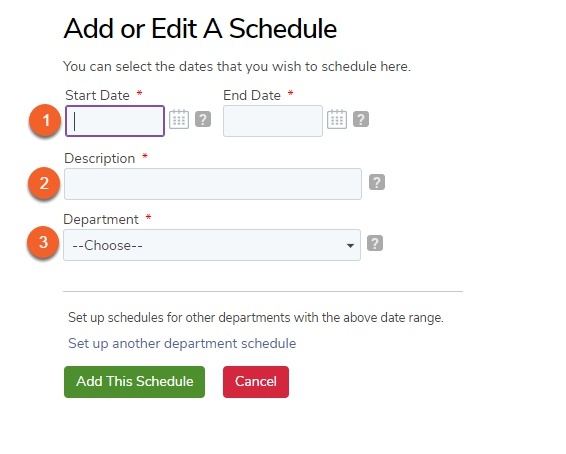 If you would like to come back later and continue editing the schedule without allowing other employees to see the schedule, simply leave the page – all of the changes are already saved.